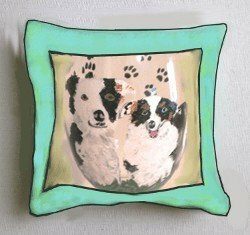 Clearly Susan hand painted Shih Tzu wine glasses reveal this wonderfully animated and amusing breed. Our hand painted Shih Tzu wine glasses reflect the liveliness and noblity of this precious, intelligent breed. These dogs descended in 17th century from crossing the Lhasa Apso and the Pekingese, and were a favorite among Chinese Nobility. If you a lover of the Shitzu then send us a picture and we will hand paint him or her on wine glasses, mugs, plates, platters anything that you can think of. My daughter loved her wine glass that she got for her Birthday. Thank you so much. You did an amazing job.